During my stay in Singapore last year, we felt like having some nice and spicy Indian food for dinner on one of the weekend nights. Eateries and stalls that cell Indian food, exist in most of the food courts in Singapore, yet for the real spicy stuff, one has to make a trip to a Singapore district known as Little India. Little India is an ethnic neighbourhood that has Tamil cultural elements and aspects of other cultures. It lies to east of the Singapore River—across from Chinatown, located west of the river. This neighbourhood now has the patronage of people of all races who wish to eat or buy something specific to Tamils culture, such as curry or Tamil clothing. With many Indians, who are non Tamil people, having migrated to Singapore, Little India now caters to Indians, Bangladeshis and people of Pakistani origins. It has major shops like 'Mustafa' that cater to large south Asian community. We were warned that on week ends, Little India is overcrowded with emigrant construction workers from south Asia, who come here to spend their weekly off day along with their friends. Even then, we decided to go there and have dinner at a famous place known as “Jaggi's” on Racecourse Road in Little India. This place is really famous for north Indian cuisine. But, after we reached the Race course road, what I saw there was just unimaginable. There is a huge empty place on one side of this road, used for parking. This empty place was totally filled up with south Asian migrants, who were sitting in groups, chitchatting eating and drinking, what they had bought from one of the numerous eateries that dot little India. Having brought up in India, I have developed a sixth sense like most Indians, which tells me, when I should avoid a place, because it has a huge potential for trouble brewing there. All that is required is a spark to ignite. This was one of those places. The spark came this week, when at about 9:23 PM local time, a private bus driven by a Singaporean, hit and killed an unnamed 33-year-old Indian man. Instantly a large crowd gathered at the accident spot. When rescue workers were trying to reach the body, which was trapped under the bus, angry bystanders smashed the windscreen of the bus, and the mob turned on police officers arriving at the scene. Soon the scene turned into a major outbreak of law and order as large groups of South Asian workers gathered to attack the bus with sticks and garbage bins. Angry bystanders smashed the windscreen of the bus, and the mob turned on police officers arriving at the scene. 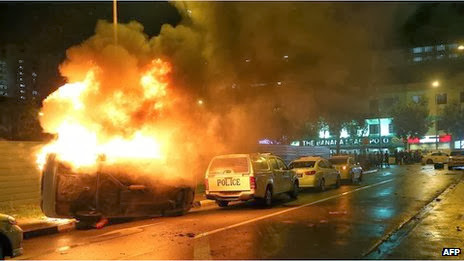 A mob of about 400 people took to the streets and went on a rioting spree then hurling street railings at police and torching police cars and an ambulance. They damaged five police vehicles, one ambulance and several private vehicles. After this, to quell the violence authorities deployed about 300 police officers, wearing Kevlar helmets and carrying riot shields, who cordoned off the area. An elite contingent of Gurkha troops was also brought in. 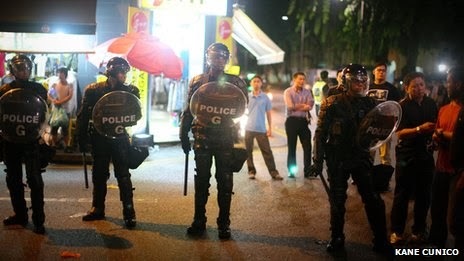 Authorities managed to quell the violence only after 11 PM and arrested 27 people, who are all of south Asian origins. Official communique says that no fire arms were used. 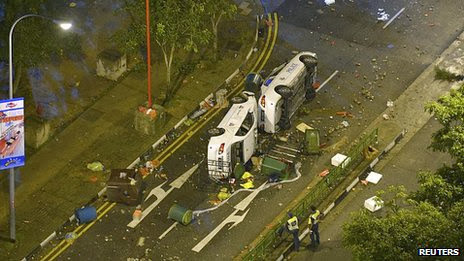 Singapore's Civil Defense Force says that at least 18 people were sent to hospital, including four of its first responders. 10 Police officials also were hurt, but none of them seriously. The bus driver involved in the fatal accident was hospitalized. It is obvious that Singapore's strict laws would be enforced here. Police officials say that this is the first case of rioting in last 30 years and they were treating the incident as a case of rioting with dangerous weapons. This offense carries penalties including up to 10 years' jail, as well as caning. Singapore being a hi-tech, wealthy city, Singaporeans mostly refuse to do dirty jobs. The city state depends heavily on guest workers, with labourers from South Asia dominating sectors like construction. The island state of Singapore with its 5.3 Million inhabitants, employees 1.3 Million large foreign work force. The vast difference in living standards between locals and migrant labour has given rise to a social strife, as there is feeling among foreign work force, particularly low-pay unskilled workers in construction, of being exploited by their employers. Last year, about 170 public-bus drivers hired from China went on a rare and illegal strike. The Singapore authorities responded by deporting all of them back to China. The rioters can certainly expect that kind of treatment very soon, if they are not charged in a court of law. Singapore police commissioner tacitly accepts this fact as he admits: “ police would pay extra attention not just to Little India, but also to foreign-worker dormitories and known places of congregation, moving forward." The Indian High Commission said in a statement that it was "in constant touch with the Singapore authorities to ascertain the facts of the incidents" and would "provide all assistance to affected Indian nationals." While moving around in Singapore, I have seen these migrant workers being transported to work places in open trucks. Many a times, photographs of their dormitories appear in the press highlighting the unhygienic conditions. If Singapore wants avoid these kind of incidences in future, it needs to do something better and improve living standards of the large emigrant labour force. As long as the cost benefit ratio of these riots favors hiring foreign cheap labor, it will continue. Even illegal immigrants will be tolerated like in US. Because money is more important as long as your own life is not in danger.